Japan’s most famous tea isn’t leafy—it’s the powdered green tea matcha, and it creates an exquisite cuppa that brims with health benefits and is a ritual in itself. For four hundred years, people partaking in chanoyu, the Japanese tea ceremony, have enjoyed matcha. 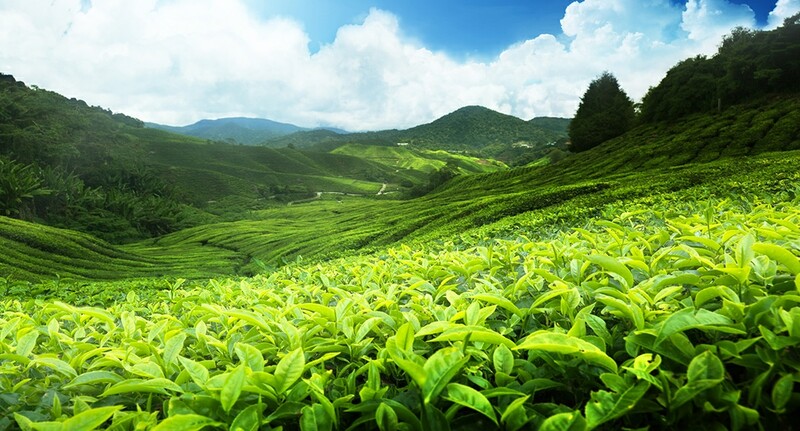 The tea’s unique creamy texture has a vegetal, fresh, sweet aroma and tastes pleasantly astringent. Today, tea enthusiasts sip matcha as casual cups of rich and frothy tea—hot or iced—and explore its flavor potential in other recipes, from breakfast smoothies to desserts. Growing matcha requires an extra step that its other green tea cousins don’t—matcha tea bushes spend several weeks growing under trellises that protect them from the sun. This protected growth time actually changes the internal chemistry of the leaf, resulting in an extra-rich taste, additional beneficial amino acids, and higher antioxidants. Matcha leaves also get extra attention when they are processed. In fact, matcha is only made in specialized tea factories designed to turn bulky, fresh tea leaves into finely milled, silky smooth powdered tea. In the matcha factory, once the stems and leaf veins have been removed from each leaf, the remaining torn bits of leaf are funneled into small granite mills consisting of two opposing and very finely scored grinding stones. The movement of the stones is slow and precise—it takes approximately one hour to obtain a half-ounce of matcha. Because of this meticulous process, matcha delivers the most nutrients per cup of any green tea. It is estimated that you only get 30 to 40 percent of the healthy nutrients—including vitamins A, E, and beta-carotene—from leaf teas, whereas matcha retains nearly 100 percent of the available nutrients. The result? A bright green powder that does not dissolve in hot water (it is not instant tea) but is so microfine that it “surrenders” to the water, leaving a fine layer of tea sediment at the bottom of the cup. When shopping for matcha, take time to look at ingredients—many types of powdered green tea are sold in the market but most aren’t authentic matcha. Avoid powdered tea that contains sugar, milk products, or other stabilizers—true Japanese matcha is comprised of only ground tea leaf, pure and simple. Matcha should be purchased within the year that it was produced, so look for an expiration date. Real matcha can be costly, but the pleasure it gives is priceless. Want to make a cup of matcha? Whisk matcha and hot water vigorously with a traditional bamboo tea whisk or a milk frother to incorporate the tea powder well. Try matcha in fruit smoothies, tea cocktails, and desserts such as cookies, custard, ice cream, and pound cake. Matcha smoothies are easy to make: Whisk 2 teaspoons (or more) of matcha into one cup of plain yogurt. Add 2–3 cups of fruit and/or fruit juice, and sweetener or ice cubes (optional). Matcha is particularly delicious with these combos: mango and apricot; cantaloupe and strawberry; apple and raspberry; or banana and pineapple. Here are some additional quick and easy ideas for incorporating matcha into everyday foods. Put a little matcha into a fine hand-held strainer and gently tap some “matcha snow” over a dollop of whipped cream to accompany poached pears, a pecan pie, or a cup of hot chocolate, or dust onto a serving of fresh fruit salad topped with yogurt. For a tasty addition to your favorite sandwich or chicken salad, make a colorful matcha mayonnaise in a snap by using 1 teaspoon matcha powder per ¼ cup of mayonnaise. Blend until smooth and add a few drops of lemon juice to brighten the flavor. Sprinkling grainy sea salt on salads, vegetables, or meats adds crunch and flavor—try mixing ½ teaspoon matcha powder to 1 tablespoon grainy sea salt for a splash of color and flavor. Mary Lou and Robert J. Heiss are the co-owners of Tea Trekker and teatrekker.com, and co-authors of The Tea Enthusiast’s Handbook and the James Beard–nominated The Story of Tea.